One of these guys has kicked the bucket, so the search is on for a replacement. Here are the two finalists, which, as the kiddos have pointed out, are "both pretty much the same." Very helpful. I like the top one best! :) Love your blog! I like it most because while it is similar to the second one, it also has its own look and feel. Which, to me, makes it more unique and attractive. It's not like everyone else's!! I choose top one. Not as "heavy". I love your blog. If one is twice as much as the other, then it's a no brainer- go for the cheaper since they are so similar. Otherwise, I LOVE them both and the second one best. Check out my blog: http://mullismemories.blogspot.com/ it's new and I am in need of followers and comments. My favorite is the top one but - I agree that if one is twice as much as the other then go with the cheaper b/c they are SO similar! Now tell us already - which is cheaper?!?!? lol! the cheaper one, whichever one that is. but the top one is lighter. My favorite one is always the cheaper one. At least that's what I tell myself. Whatever... I LOVE the bottom one the best! Is it the more expensive one? Just talked to mom tonight and I'm SO jealous you got to go to the Hill Cumorah pageant! (Or was that just Mom and Sierra and Manuel?) You've got to have some more pics of the trip! Come on! The one on the top for sure. 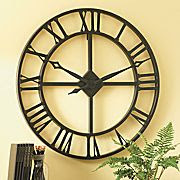 It uses the real Roman numeral for four - I bet it costs double too!!! I adore the bottom one, but honestly, they're both super cute, it would be hard to go wrong with either of them. I like the top one... which one costs more? Since you have gallons of people commenting I will throw mine into the pile. I like the 2nd one more. Now, which is more money? Just curious if my eye goes to $$$$. BOTTOM one!! for sure. it's got a nice rich feel to it. I'm loving the bottom one as well. I like that the hands have a different finish and I love the bigger numbers. It just makes more of a statement. With your house and decorations, I'd go with the first one too. 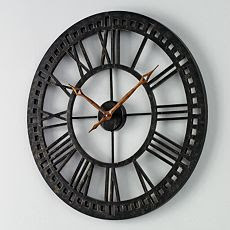 But I'd get the second one if I were you and paint the hour and minute hands (Do you like them gold? Maybe it would look better with all your decorations). I like the simplicity of the first one, but there's "something" about the second one that draws me in. All in all, I'd still pick the first if I had too. i started from the very bottom post on the first page and am working my way up from there so i'm not sure if you've already made any final decisions, but here's my two cents. I say the top one, doesn't look busy. Looks great to me.